After discussion with members of CHI staff, MABU created a solution that retooled the foundations of the CHI St. Alexius website. An entirely new wireframe was built from the ground up. It was determined this was needed to best suit the needs of this growing hospital conglomerate that serves a variety of communities across the state. Using Drupal CMS, our web team forged a content structure that prioritized crucial information like Locations and Services and did away with modules that had once cluttered the previous website. We also provided search engine optimization services, researched best online payment processing system, and trained CHI staff on proper administration of the Drupal CMS. 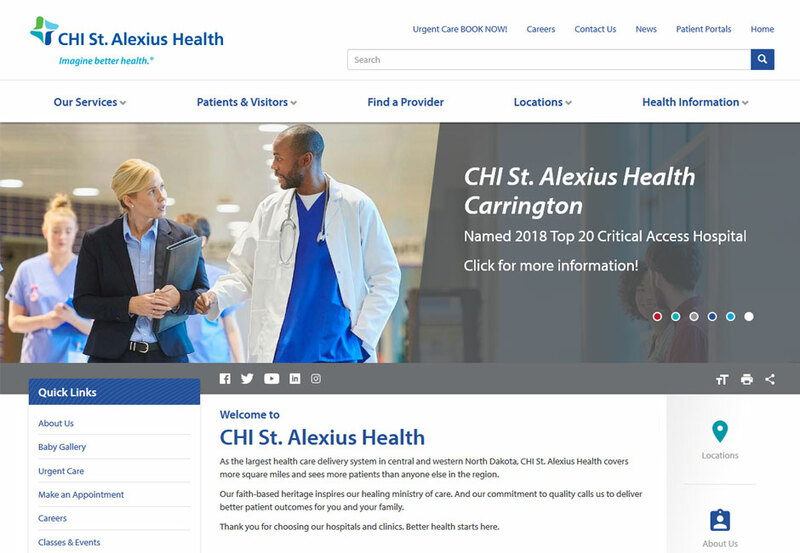 The refreshed face of CHI St. Alexius Health launched in 2018. The large platform is easier to navigate for patients and healthcare providers alike. The website provides an excellent digital experience that aligns with the commitment to quality espoused by CHI St. Alexius Health.